Your ticket option may require you to raise a certain amount by the fundraising deadline. If a fundraising minimum is required, it will be noted on this initial screen. The full agreement will populate prior to checkout. The buyer is the person going through registration. If the Buyer is also one of the Participants, you can click the box “Copy from Buyer Information” to easily have your name and email pre-populate. Required questions are marked with a red asterisk. Choose whether you would like to Fundraise as Team or as an Individual. If you choose Team, select whether you’d like to join a pre-existing team or create a new team. Be sure to add a campaign name in order to complete fundraiser setup. 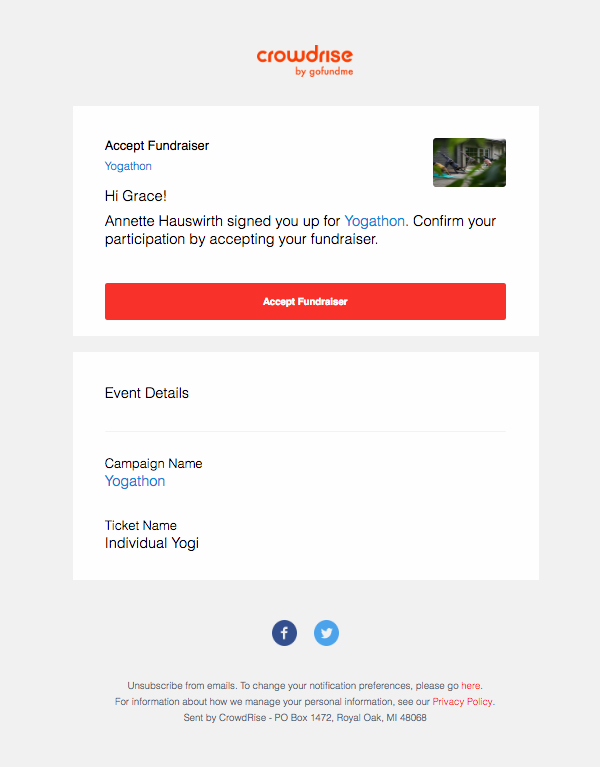 * If you’re signing up multiple people at once and they each need their own fundraising page, provide a unique email address for each participant. If you provide the same email address for everyone, you will only receive one fundraising page under that CrowdRise account. 6. Enter your payment information. One coupon code may be used during checkout to discount or remove your registration fee. The coupon code will be applied to the most expensive ticket in your cart. If a fundraising minimum is linked to your ticket option, you will have the option to authorize it on this screen. On the confirmation page, click Go to Campaign to customize your page with your own images, goal, and story text. If email addresses were provided for participants, they will receive an Accept Fundraiser email from CrowdRise to publish and access their campaign page. You (the Buyer) will also receive the registration confirmation email.